“Two-handers can fall at the first hurdle if both actors don’t give it their all. If one performer is stronger, the piece can be very unequal and unsatisfying. I’m pleased to say that’s not the case with Howie the Rookie, which boasts not one but two of the most exhilarating performances I’ve seen on stage in a long time. Padric McIntyre opens the first half of the play as loud, outspoken, brash, humorous hard nut – The Howie Lee. We learn about low life in the fast lane of modern Dublin. Fighting for survival in a world where only the strongest survive, five unforgettable characters take vivid shape through Howie’s hilarious monologues. The Rookie Lee (Graeme Hawley) launches Act Two with his tales of flatulence, gangland culture, family loyalty and his terrible dating experiences. What links these two characters is their lust for life on the edge and the shifting loyalties of their ragged gang. From the opening scene, James Anning’s superbly realised set, crowned with infested mattress and copious rubbish, drags the audience into the characters’ down-and-out world. It’s matched for ‘filth’ by Mark O’Rowe’s F-word strewn dialogue, which provides the platform for the audience to gasp as well as laugh and cry. The language is carried magnificently and naturally by two talented performers. McIntyre is perfect as the aggressive, protective leader of the pack. His in-yer-face role-swapping style leaves you with a lasting impression. Hawley, meanwhile, forces the audience to use all of their emotions, pushing them to overload with his convincing facial expressions and physical prowess. The fast-moving sub-plots and quick-fire exchanges keeps everyone on their toes. Each line is fired at the audience with on-target precision. And even if every high-octane anecdote contains a sad twist in the tail, the inevitability of it all doesn’t stop you from wishing for a more hopeful future for these two. 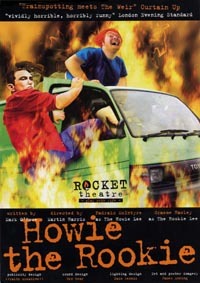 Howie the Rookie is an energetic piece with plenty of substance beneath its lean exterior. Fast, funny, and full of life – minus the sugar coating”. – What’s On Stage (Glenn Meads) 29 August 2002. “Rocket Theatre’s twenty first production is brutal, gritty and blackly funny. Praise to director Martin Harris and actors Padraic McIntyre and Graeme Hawley; this is one night out you won’t forget in a hurry”. – CITY LIFE (Steve Timms) 9 October 2002. 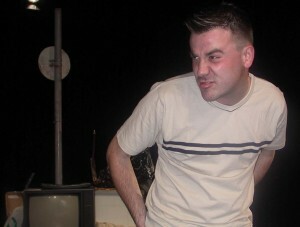 Graeme Hawley as The Rookie Lee. 28th – 31st August 2002 / Library Theatre, Manchester. 20th September 2002 / Stanwix Arts Theatre, Carlisle, Cumbria. 27th September 2002 / Darwen Library Theatre. 9th October 2002 / Performance Centre, Ridge Danyers College, Marple. 10 – 12 October 2002 / Paupers Pit, Buxton. 17 October 2002 / Nuffield Theatre, Lancaster. 25th – 26th October 2002 / Crescent Theatre, Birmingham.